Illustrations: 98 black-and-white photos, 86 line figures, 4 tables. A hundred years ago, a doctor had no way to look within the body of a patient other than to slice it open. That changed radically at the turn of the century, with the discovery of X-rays. X-ray and other forms of diagnostic imaging technology developed slowly but steadily from then until the 1970s, at which point a revolution occurred. Made possible largely by the availability of powerful but inexpensive computers, the rapid and widespread adoption of computed tomography (CT) and, a decade later, of magnetic resonance imaging (MRI) greatly expanded the power of clinical imaging, and even changed the ways in which physicians view and think about the human body. This unique guide explains how the principal imaging devices work and how they help physicians save lives. It gives readers a grasp of the major medical technologies that might come to play important roles in their lives, and it provides succinct, easy-to-understand, and reliable explanations for those who wish to explore the issues of the associated benefits, costs, and risks in an informed manner. 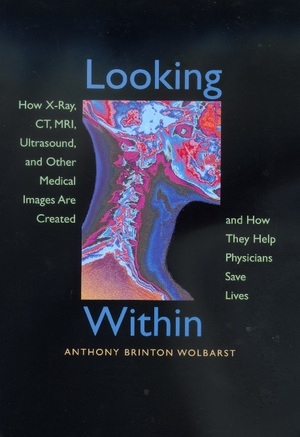 In nonspecialized language, Looking Within discusses how X-ray, fluoroscopic, CT, MRI, positron emission tomography (PET), ultrasound, and other medical pictures are created, and explores the essential roles they play in the diagnosis and treatment of patients. It should be of interest to patients and their friends and loved ones, and to those who are simply curious about this vitally important, exciting, and cutting-edge branch of medicine. Its brief but clear descriptions of how these essential tools work should also be of value to health care providers in supporting and educating their patients. Anthony Brinton Wolbarst, a physicist formerly at Harvard Medical School and the National Cancer Institute, is currently at the U.S. Environmental Protection Agency and an Adjunct Associate Professor at Georgetown University Medical School. Dr. Wolbarst is the author of Symmetry and Quantum Systems: An Introduction to Group Representations (1977) and Physics of Radiology (1993), and editor of Environment in Peril (1991).